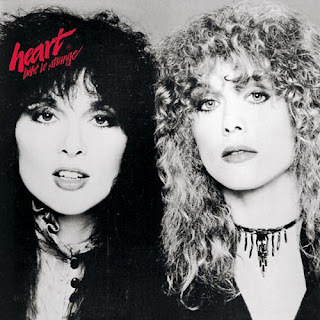 Well would you believe it, I first heard the band Heart on Radio Caroline, and guess when? Yep in the 1970's! They may have been given air time elsewhere in the UK, but the option of suffering The Bay City Rollers, Donny Osmond and possibly Cliff Richard's to eventually here them does not require consideration. This is Heart some time later, 1987 to be precise, however I must apologise I do not have the actual day or month to hand. This concert is from the tour supporting the release of 'Bad Animals' - not one of their best albums as far as I am concerned, and yet, they are on sparkling form here, and with plenty of other Heart material, very, very good! Think about it? A band comes together from the pedigree of The Small Faces, and The Jeff Beck Group, during the late 1960's. They are all broadly inspired by R&B, Blues, and good old rock'n'roll, and like a drink or two before, during, and after any concert. As a bonus each and every one of them can play their part to a very high standard. I give you The Faces ! Against that background how can any band stay together for more than a few short years. It is no wonder they were instant favorites of the UK's then premier DJ John Peel, and that their gig's have attained legendary status for concert goers of that time. There is a good synopsis over on wikipedia (click HERE), that briefly captures The Faces history. This for me, with fond memories, was all about having a great time, unashamedly doing the rock'n'roll thing, with all the excesses, even if I was to young to actually join the party! In my own humble opinion the following live Beatles recordings are incredible. Boots from the early 1960's are often disappointing, and for obvious reasons. They are not official, they are copies of copies of copies... you get the point! The equipment used (even if professional) had limitations, often the crowd noise is more dominant and... OK this is over kill - point made !!! However very recently some new tape sources of The Beatles have emerged, which are close to pristine for their time. You may note the odd speed fluctuation or adjustment as some very tender remastering has been undertaken. However this is very much The Beatles as they sounded live in 1963 and 1964. It is a must for any Beatles fan, or fan of early guitar rock bands. STOCKHOLM, SWEDEN - OCTOBER 24, 1963 (From best known source to date). Back in March I featured a couple of tracks from the 'Lord of Madness' boot. I have kind of got my act together since then, and am now pleased to share the whole album. To recap - In 1968 The Beatles were both at Trident and EMI studios in London. Some excellent (performance and recording quality) material was created, final versions of which are found on The White Album. Lord of Madness are versions in production, another piece of The Beatles history, for collectors. This is studio quality material - enjoy. FULL REPLACEMENT LINK NOW IN COMMENTS BELOW (18th APRIL 2009).